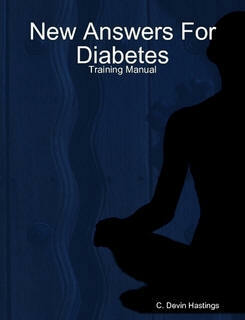 This book accompanies my two day Diabetes Motivational CoachTM certification workshop. * Move your practice into a high demand area where there is very little competition! * Acquire the essential information necessary to powerfully help over 90% of all diabetics dramatically improve their condition by permanently reducing their weight. *With your specialized training you can help persons with diabetes and pre-diabetes to powerfully and effectively manage their situation. ---"After the diabetes workshop in the UK last year, I had an unprecedented number of complimentary messages of praise to be passed on to Devin. All of them were inspired and for many, it was the first time they had experienced a workshop giving inspiration, power and LOVE all in one package. ---"This breakthrough material will change the lives of a countless number of diabetic patients permanently for the better. Every allopathic practitioner that has diabetes patients will welcome this new motivational program." The workshop is an intense two days that often changes some students lives dramatically. One of the most common questions I get asked is: "Do I need to be a hypnotist to attend?" The answer is no although being a trained hypnotist will always improve your personal and professional life immensely. I have had social workers, M.D. 's, engineers, lawyers, psychologists and many other persons benefit from this workshop. Something that can help whether you are a diabetic or know someone with diabetes, is reading the articles I have on this website. So, have a look by clicking either diabetes article link below and then think about the workshop.